This past weekend was the Chicago Renegade Craft Fair. It was the best I’ve done in the three times I’ve done this particular Renegade. 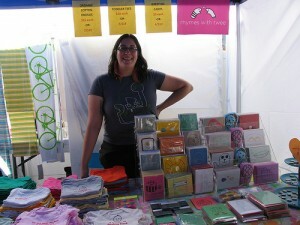 I had a great time selling with my boothmate and good friend Eliza of Purse-onality. I had a meet & greet with Hermione on Sunday, but somehow did not take pictures. It was hard relaying the news of Hoggle passing away to customers who were such big fans of him. I haven’t blogged that, but he passed away August 1, 2009. The sad details are in this listing on my Etsy shop. Many of my favorite crafter pals were selling this weekend. It was awesome getting to see them all and hang out with them. Esther (Essimar) gave me the custom piece she made of Hoggle. It’s really perfect. Sofia Masri gave me these awesome hedgehog clips she found at Paper Source. The high point of my weekend was hanging out with Jess Gonacha and her friends and friends of friends (A Bardis, Swear Jar Design, and Vital Industries) at Jerry’s. It was awesome being in the company of such unique and inspiring makers. The low point of the weekend came when I was standing on a plastic IKEA chair (putting my banner that had fallen down back up) and I fell right through it and my leg was stuck in between the plastic and the metal and somehow I hit or scraped my ear on something. It was embarrasing more than anything, but I felt off the rest of Sunday. Zachary pointed out that I have a weird bruise on my left ear that is tender to the touch. I have some great news to counter that last bit though! Brooke Timm, a craft pal came by my table. I met her when she was selling at Handmade Market at the Empty Bottle under the name LadyRocket. Now she’s opened this store Rudy’s Roundup. Brooke and her store manager picked out Rhymes with Twee onesies, greeting cards, and artichoke stuffies to carry. I can’t wait to go check out this store, which has been on my radar for awhile now, but I’ve too busy making stuff to stop by! On October 3rd, I’ll be at Crafty Bastards in DC selling with my buddies Les & Oscar. I’ll be driving out there with Miss Alison. I’m so excited because it’s one of my favorite fairs and I’ll get to hang out all day with friends I don’t see very often. I’ll also get to meet internet pal Becky of Glue & Glitter. Lastly, my most recent craft project is pictured above. 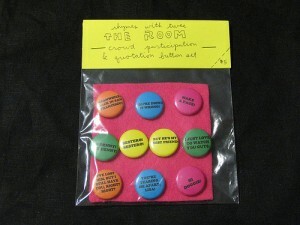 THE ROOM – crowd participation & quotation button set is up in the shop for all you Tommy Wiseau fans. It’s playing in Chicago at the Music Box on September 26th at the midnight showing, of course. It will be my fifth time seeing it.